I wish we could not think about such things, I really do. I wish the terrible thing that happened this weekend, be it drugs, an accident, or something more sinister never happened, because I remember Whitney, like so many of us, full of life, and with a voice beyond compare, it is hard to examine anything evil regarding her life and death. Yet, if you follow at all what is going on in the Music Industry today, with it's many strange and unexplained deaths, (think Michael Jackson and Amy Winehouse of recent) and the bizarre occult rituals within the industry ( think Lady Gaga, think Beyonce, and the recent Super Bowl show of Madonna to name just three of a thousand) it has to make you wonder. This I do know, there is a battle for the soul of this nation happening, and don't think it doesn't manifest itself in many ways and in many of our institutions. -W.E. As someone who grew up during the peak Whitney Houston’s career, witnessing her downfall and, yesterday, her untimely death, has been difficult. Blessed with arguably the biggest voice ever heard in the music industry and endowed with a fiery personality that matched it, Whitney was the archetype of the diva superstar. Her song I Will Always Love You is now the ultimate song for aspiring singers to showcase their talents. However, no matter who attempted to take on that on that song, they exposed themselves to the same comment: “Good, but not as good as Whitney”. She was the personification of pure, God-given talent. Unfortunately, the saying “The higher they fly, the harder they fall” has applied to Whitney all too well. The young girl who got discovered while singing in a church choir and who went on to become most awarded female act of all-time descended into a fiery hell of drugs, abuse and trauma. Upon learning about her death, I immediately recalled a particular interview that disturbed me. It was the lengthy interview she gave Oprah in 2009, where she described her drug usage and her tumultuous relationship with Bobby Brown. While her words were unsettling, it was her entire demeanour that got to me. The diva personality was gone. The fire in her eyes was extinguished. She simply wasn’t the same person I saw during the 90′s. When she took the stage to sing her new single, the heavenly voice we expected to come out wasn’t there. It was as if her soul was sucked out of her. Oprah: Did you think something was gonna happen in those drug-crazed, drug-filled days where you’re sitting for hours and days? Whitney: There were times when he (Bobby Brown) would smash things, break things in the home. Glass. We had a big, big giant portrait of me and him and my child. He cut my head off the picture. Stuff like that. And I thought, “This is really strange.” So I figured, cutting my head off a picture, that was a little much for me. That was one sign. And then there were other things like he started to paint in my bedroom eyes. Just eyes. Evil eyes that were looking at every point of the room. Oprah: He started to paint on the walls? Oprah: What are you doing with all of that? Whitney: I’m looking at it going, “Lord, what’s really going on here?” I was getting scared because I felt something was going to blow. Something was going to give. Marijuana and cocaine can make people do crazy things, but this kind of behaviour was symptomatic of something a lot deeper. The cutting of one’s head and “evil eyes” are two obsessions of mind control victims (and/or spiritually disturbed people). Whatever the case may be, something awful happened to Whitney Houston in the years following her success. But what? What was Bobby Brown’s role? Difficult to say. In the same Oprah interview, Whitney described her mother’s attempts to rescue her. Whitney: She said, “It’s not worth it.” She said: “If you move, Bobby, [the sheriff will] take you down. Don’t you make one move.” And he stood there like he was scared. Now, the day before “music’s biggest night”, Whitney was found dead in strange circumstances (apparently drowned in her bathtub) at age 48. As usual, drugs were almost automatically mentioned as a cause of her death. However, as it was the case for Michael Jackson, Amy Winehouse and so many others, the investigation will probably be a long tedious process, full of vague statements and many contradictions. 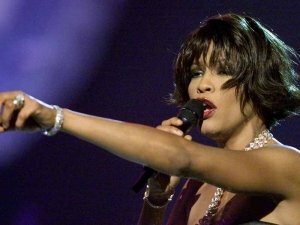 There are already reports of Whitney acting erratic in the hours before her death. “First she first visited Brandy, Monica, and Clive Davis at rehearsals for the mogul’s pre-Grammys party, where a Los Angeles Times reporter described her as reeking of alcohol, “visibly bloated,” and “disheveled in mismatched clothes and hair that was dripping wet with either sweat or water.” According to the Times, when Houston wasn’t mugging and gesticulating wildly for Brandy and Monica — who were doing a media junket, as well as preparing a duet — she was alternately skipping around the lobby or “wandering aimlessly” around the Beverly Hills Hotel grounds. Reportedly, guests had even called security to report the singer doing handstands by the hotel pool. Despite her death at the fourth floor Beverly Hilton Hotel, the traditional pre-Grammy show, with its glamour and glitz, took place at the same location…while her body was still there. As they say in showbiz, “the show must go on”. The show will indeed go on and I’m somehow reticent to see the kind of tribute the industry music is reserving her. If Michael Jackson and Amy Winehouse are any indication, those who fall off the grace of the industry do not get a proper tribute…but a celebration of their sacrifice. Was Whitney’s death an actual sacrifice or simply the result of years of abuse? The same question applies to countless artists who died too soon and in bizarre circumstances.